But what does that mean? How should we actually pray for them? Will a “blanket prayer” work? Just one big “Bless them all, Lord!”? I’m going to take a few posts to outline some things that I’ve learned from my personal study on this topic. What does the scripture say about praying for other believers, particularly those serving as missionaries or ministers of the Gospel? Let’s start with a something so vastly important yet incredibly basic. 1. Get To Know Your Missionaries! But that means nothing if you don’t make an effort to keep up with them. Supporting missionaries financially is important, yes, but make an effort to put a face to the check you send. When you know your missionaries and try to keep up with what’s going on, you’ll feel like you’re doing more than sending empty checks and prayers out into the eternal abyss for an unknown soul. You’re interceding for and investing in a friend. As your read the epistles from the Apostle Paul to the New Testament churches, you’ll see that there was a definite friendship between them. He knew that they were more than converts or supporters. They were brethren in Christ and “Yokefellows” in the ministry. Friends. Get to know your missionaries. So many times we are so preoccupied praying about our own needs, our wants, our family, and the bunion on our toe that we completely forget to pray for what Jesus Christ TOLD us to pray about. Sure, he cares about your bunion, but do you know that one of the few, if not the only direct prayer request Christ gave us was for Laborers for the Harvest? That’s an incredible thought. He lifted up his eyes and saw the multitudes. He had compassion on them. He was moved for their necessity. And we… we are focused on ourselves. When is the last time you took time to pray specifically that God would send more missionaries into the world? Take a map or a globe, pick a country and ask God to send laborers there. Research the need. Population. Religion. Current works. Then beg the Lord of the harvest that he would send forth laborers into his harvest. 3. Pray For An Open Door! Missionaries must work hard. They must put forth an effort to study diligently, learn a new language, adapt to a new culture, reach people, train people, lead people and duplicate themselves. But all of this is in vain unless the Holy Spirit opens up a door. What’s an open door? It’s an opportunity. A chance to reach somebody, win them and train them. It’s an opportunity to glorify God. So, just as Paul asked the Colossians and others to pray for an open door of utterance, pray this for your missionaries. Missionaries, just like anybody else, have to make a lot of decisions. The difference is, many times, that these decisions are life threatening. One bad decision and a missionary can loose his entire family, ministry, ability to serve in a country and even his own life. A lot is at stake. Pray for wisdom. Many of today’s missionaries are afraid. Scratch that. Many of today’s Christians are afraid. This passage was written in a time when people actually suffered for their faith, and to a people who actually knew what true persecution was. Paul, who asked them to pray for him, was a man who was already quite bold. Yet he recognized the need for more boldness. Without a doubt, one major component that is missing in today’s missionary movement is boldness. When did the Gospel all of a sudden become secret? When did it become something that we are to hide? When was it made politically correct? God loves you. You have sinned and broken his law. You deserve to be separated from him for eternity. Jesus died on the cross to pay your punishment. He rose three days later to give you the victory. You must accept his gift of salvation. He is the only way. He is the only truth. He is the only life. Repent, or ye shall all likewise perish. This is the Gospel. Paul said in the book of Romans that he isn’t ashamed of the Gospel because it is the power of God unto Salvation! Missionaries need boldness to speak of Christ and live for Him! All Christians need boldness. The salvation of the lost depends on our willingness to proclaim the message. Pray for boldness! He wants to stop the work of God. He wants to stop the servants of God. And he doesn’t play fair. Pray that God’s word would have free course and that he would put a hedge of protection around your missionaries. Pray for their family. Pray that nothing would stop the work of God. 7. Pray for Help In Trials! There will be many times that a missionary goes through hard times—political unrest, persecution, financial difficulties, health problems, disruptions in the ministry and so many other things. These are trials that merit our prayers. But, instead of praying that God just take away the trials, pray that through the trials, there would be more dependence in God instead of the flesh. That’s what God’s word tells us here. We can face the hardest of trials because we have a great God. He is our sufficiency. He is our all in all. He delivers us. Pray for your missionaries to have help in trials. 8. Pray For A Fruitful Ministry! There is probably nothing more frustrating to a full-time Christian worker than not seeing fruit after hard work in the ministry. You’ve probably been there yourself. You feel like your wheels are turning and you aren’t getting anywhere. You’re just going through the motions. There is no fruit. There are no results. There just doesn’t seem to be anything happening. So, let’s back up a little. What is fruit? Spiritual fruit is seeing souls saved, lives changed, the work of God advanced and His Glory elevated! The Bible talks a lot about having fruit. He tells us that having the Holy Spirit in our lives will bring forth certain fruit. He warns us to watch out for false teachers, because “by their fruits ye shall know them.” He also informs us that some may plant and others may water, but it is God that brings the increase. So how can we actually pray for a fruitful ministry? Pray that God gives wisdom in sowing the seed. Just as the parable of the sower of the seed, a lot of effort might be invested in sowing seed into ground that is stony, thorny, bare and infertile before the good ground is found. Missionaries will have to reach out to many people to win just a few souls. May God give direction as to where those few souls are located. Also pray that the missionary doesn’t give up. Many times God gives a dream that won’t come to fruition until years later. It takes a long time to nurture an apple tree before it begins to yield good fruit. Many ministries may be the same. And lastly, pray that the name of God is lifted high, no matter the quantity of fruit that is harvested. A missionary may get discouraged that his ministry isn’t as big as another missionary’s ministry. That isn’t the point. Let’s get our eyes off of other people and onto Jesus, the Author and the Finisher of our faith. The Bible tells us that some will bring forth thirty fold, others sixty fold, and even others one hundred fold fruit. The main thing is that we are faithful with the seed that God gives us, faithful in distributing it, and faithful in harvesting it. God will handle the rest. Pray for a fruitful ministry. 9. Pray For A Missionary’s Personal Battles! Every family experiences its hardships. Every marriage has its stresses. Every individual has personal temptations and battles. But I dare say that those in Christian leadership face all these battles multiplied over many times. One man once said, the higher you rise in leadership the bigger the target you become. How true that is for missionaries! Satan knows that if he can stop an otherwise faithful missionary, he can stop the salvation of hundreds, thousands or even millions of people when you take into account the fruit of those that the missionary will train. Being so far from those that are close to them, many times missionaries face battles with loneliness. They face battles as they adapt to a foreign language, a different culture and a whole different set of customs. Because of the nature of their financial support, they face battles with finances. Their income can vary by hundreds or even thousands of dollars per month, and if this becomes the focal point of their attention, stress will ensue. Any problem that may already exist in a marriage is brought to the surface and magnified when put under the pressure and stress that being on the mission field can cultivate. Pray that the missionary resists temptations. Satan wants to see him fall. He’ll do what it takes to get him to stumble, because he knows that others are watching him. Pray for your missionary’s personal battles. So they can be prepared to stand in the evil day. And having done all, to stand. So how do we put all of this into practice? Well, as I mentioned in Point 1, you have to connect with your missionaries to know what’s going on in their lives and ministries. After you know these things you can more efficiently pray for them and their families. Get a burden for their ministry. Make it your ministry! Put yourself in their shoes and pray for their family as if it were your own. Set aside time to pray for your missionaries. Make a list of missionaries to pray for and pray for them. Pray for them individually. Pray for them as a family. Pray for them with friends from your church. Pray for them continually! 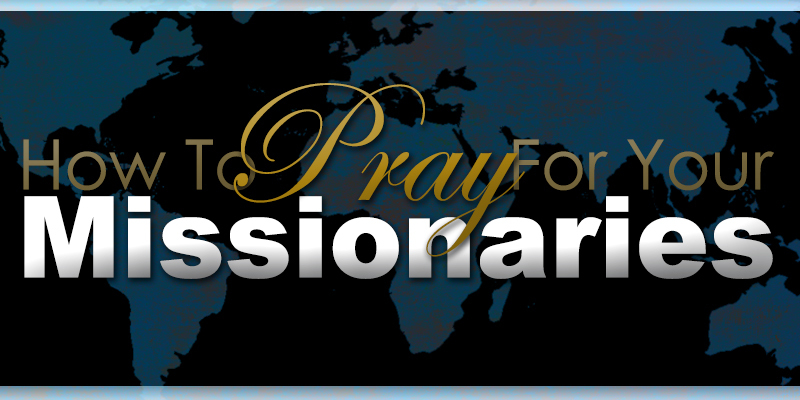 Pray for missions collectively and specifically. What do I mean by that? Pray for the missionaries as a whole, but then also take time to mention them by name. Then, beg God to do a work in the world as he raises up laborers for His harvest. Let’s pray for our missionaries!